The Ashdown ABM C115-500 EVO III combo amp combines the features of the ABM 500 EVO III head with a single 15" Ashdown BlueLine driver in a precision tuned cabinet. The cabinet is constructed from high-grade birch ply with properly screwed and glued joints, protected by a tough, buffalo leather cloth covering and chromed metal corners. 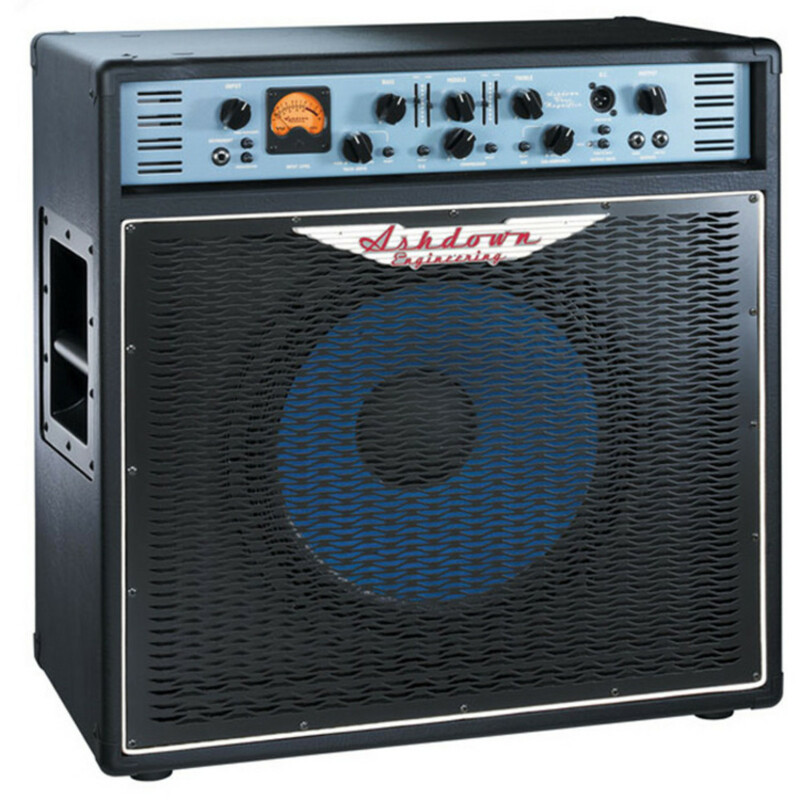 All amplifier chassis are built from heavy-duty 16 swg zinc coated mild steel, foil lined to minimise interference, and special Ashdown-designed metal handles are used in favour of inferior flip handles which can rattle after years of use. The ABM 500 EVO III is a 575 watts RMS bass amp head designed to satisfy both bass-purists and tech-heads alike. Three straightforward rotary tone controls provide 20dB of cut and boost at 60Hz, 660Hz and 5kHz, and are supplemented by two pairs of additional sliders giving 15dB cut and boost at 180Hz, 340Hz, 1.3kHz and 2.6kHz. The EQ can be switched in/out by a footswitch, enabling players to go from a flat fretless sound to a boosted sound via a favourite EQ setting. A single input is switchable for passive and active instruments with a blend of solid state and dual triode tube preamps stages which can be preset and selected by footswitch, providing access to a massive range of clean, warm and overdriven tones. Also footswitchable is the on-board compressor and the mighty Ashdown sub-harmonic generator which precisely tracks the main signal and reproduces it an octave lower. A sub-harmonic level control enables the player to add just the right amount of low-end reinforcement - everything from a subtle, thickening of the sound to unbridled, bone crushing tone. The ABM 500 EVO III features a front-panel mounted balanced DI out with pre or post EQ switching, a sub-bass output, a tuner output, an FX loop and a line input for the connection of an external sampler or sound source. Output muting cuts the signal from the DI output but leaves the tuner output 'live', allowing the player to tune up in silence. A new upgraded power section has faster transient attack, more headroom and even less noise.